hydro: Documentation generated on August 27, 2015 at 01:08 PM (doc job). indigo: Documentation generated on July 09, 2018 at 10:32 AM (doc job). jade: Documentation generated on August 11, 2017 at 10:12 AM (doc job). kinetic: Documentation generated on July 08, 2018 at 10:10 AM (doc job). lunar: Documentation generated on July 08, 2018 at 10:35 AM (doc job). melodic: Documentation generated on February 22, 2019 at 11:30 AM (doc job). What does tf do? Why should I use tf? You want to see what tf can do instead of just reading about it? Check out the tf introduction demo. Where was the head frame relative to the world frame, 5 seconds ago? What is the pose of the object in my gripper relative to my base? What is the current pose of the base frame in the map frame? tf can operate in a distributed system. 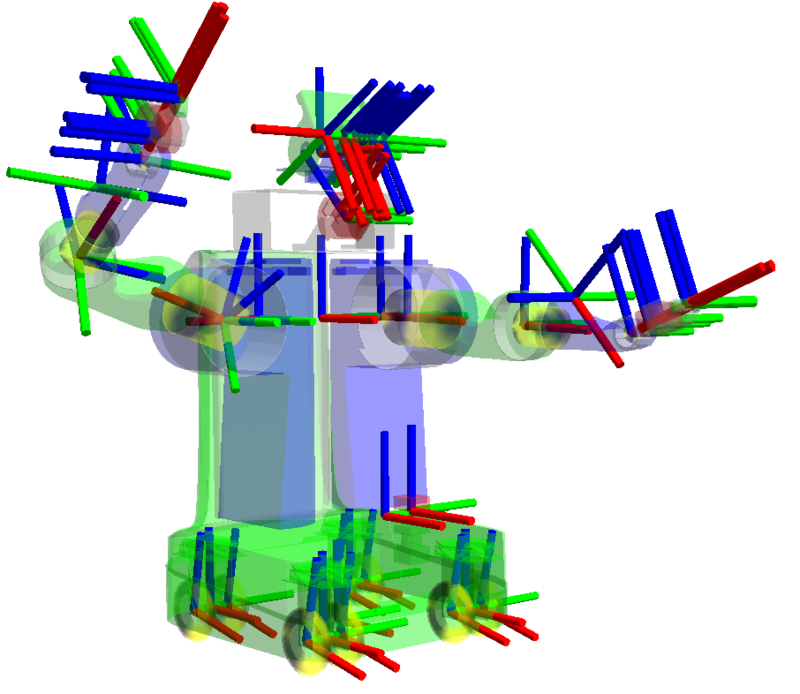 This means all the information about the coordinate frames of a robot is available to all ROS components on any computer in the system. There is no central server of transform information. We created a set of tutorials that walk you through using tf, step by step. You can get started on the introduction to tf tutorial. For a complete list of all tf and tf-related tutorials check out the tutorials page. There are essentially two tasks that any user would use tf for, listening for transforms and broadcasting transforms. Listening for transforms - Receive and buffer all coordinate frames that are broadcasted in the system, and query for specific transforms between frames. Check out the writing a tf listener tutorial (Python) (C++). To extend the capabilities of a robot you will need to start broadcasting transforms. Broadcasting transforms - Send out the relative pose of coordinate frames to the rest of the system. A system can have many broadcasters that each provide information about a different part of the robot. Check out the writing a tf broadcaster tutorial (Python) (C++). Once you are finished with the basic tutorials, you can move on to learn about tf and time. The tf and time tutorial (Python) (C++) teaches the basic principles of tf and time. The advanced tutorial about tf and time (Python) (C++) teaches the principles of time traveling with tf. view_frames: visualizes the full tree of coordinate transforms. tf_monitor: monitors transforms between frames. roswtf: with the tfwtf plugin, helps you track down problems with tf. static_transform_publisher is a command line tool for sending static transforms. You may also wish to use the tf_remap node, which is a utility node for remapping coordinate transforms. Publish a static coordinate transform to tf using an x/y/z offset in meters and yaw/pitch/roll in radians. (yaw is rotation about Z, pitch is rotation about Y, and roll is rotation about X). The period, in milliseconds, specifies how often to send a transform. 100ms (10hz) is a good value. Publish a static coordinate transform to tf using an x/y/z offset in meters and quaternion. The period, in milliseconds, specifies how often to send a transform. 100ms (10hz) is a good value. view_frames is a graphical debugging tool that creates a PDF graph of your current transform tree. NOTE: See also rqt_tf_tree that allows dynamic introspection of the frames. tf_remap listens to the /tf_old topic and republishes transforms on the /tf topic. This is mainly used with out-of-date bag files that need their coordinate frame IDs updated. The typical operation for this node is to play the bag file with /tf:=/tf_old. The tf_remap node is run with a ~mappings parameter that describes the mapping of frame IDs from old to new. Old transform tree. This is usually published by remapping playback of a bag file. You may need to set use_sim_time true for the bag file transforms to be accepted. Current transform tree. This is the normal /tf topic. List of dictionaries that map old tf frame IDs to new frame IDs. Each dictionary in the list must have an "old" and "new" key. change_notifier listens to /tf and periodically republishes any transforms that have changed by a given amount on the /tf_changes topic. Frequency (hz) at which to check for any changes to the transform tree. Minimum distance between the origin of two frames for the transform to be considered changed. Minimum angle between the rotation of two frames for the transform to be considered changed.